WATERLOO - Nancy J. Bauler, 66, of Minnesota, formerly of Waterloo, died Saturday, Oct. 17, at Covenant Medical Center of natural causes. She was born Sept. 26, 1943, in Shell Rock, daughter of Carl and Nellie DeWitt Nieman. She married Donald W. Bauler on May 27, 1967, in Waterloo. He died July 25, 2006. Mrs. Bauler was a graduate of Waverly-Shell Rock High School and was employed at Bishops as a waitress for 10 years. She most recently was employed with Princess Soft Toys in Minneapolis for 12 years until her retirement. Survived by: two sons, Darren and Dan, both of Waterloo; a daughter, Denise Bauler of Waterloo; three brothers, Michael (Laura), Dennis (Maria) and Steven (Rachel) Nieman, all of Shell Rock; a sister, Connie Rust of Shell Rock; and a sister-in-law, Marlys Nieman of Shell Rock. Preceded in death by: a brother, Carlys Nieman. 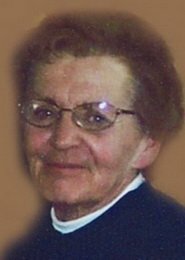 Services: 10:30 a.m. Wednesday at Immaculate Conception Catholic Church, Gilbertville, with inurnment in St. Mary's Cemetery, Eagle Center. Public visitation from 4 to 8 p.m. Tuesday at Hagarty-Waychoff-Grarup Funeral Service on West Ridgeway, where there will be a 4 p.m. rosary and 7 p.m. time of sharing. Visitation also an hour before services Wednesday at the church. Memorials: may be directed to Covenant Cancer Treatment Center.